Lamia Barakat, PhD, director of Psychosocial Services at CHOP's Cancer Center, was featured in syndicated article about how children survive cancer and what they can teach adults. CHOP researchers are part of the team that reduced blood vessel blockage in rats using magnetic fields to drive drug-loaded nanoparticles. Meet the Epstein twins, successfully treated before birth for twin-twin transfusion syndrome by the Center for Fetal Diagnosis and Treatment at CHOP. Their story was featured in the Newark Star-Ledger. Shortly after birth, Nicholas underwent surgery at CHOP to repair a hole in his diaphragm, a birth defect called congenital diaphragmatic hernia. Children can have strokes, and the strokes can recur, according to a recent study by Rebecca Ichord, MD, a pediatric neurologist at CHOP. Recognizing stoke in children can speed treatment and prevent recurrences. 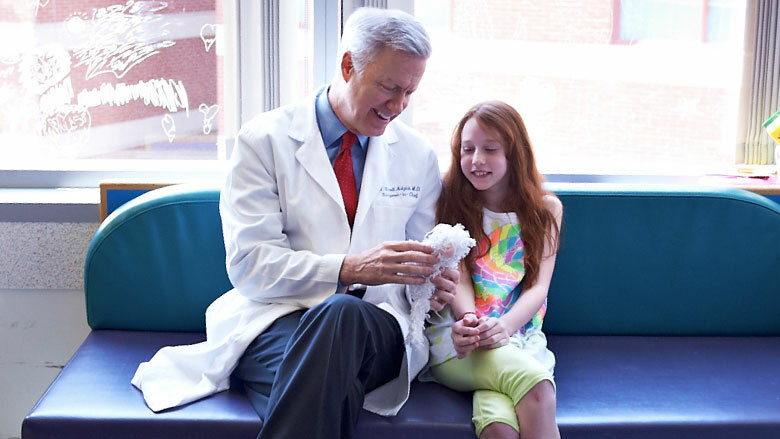 CHOP Oncologist Jill Ginsberg, MD, is featured in a Fox TV story about Chad Juros , a patient at The Children's Hospital of Philadelphia who received successful cancer treatment. Researchers at The Children's Hospital of Philadelphia show that a second dose of gene therapy for inherited blindness is safe in animals. Danny Gilroy, prenatally diagnosed with congenital diaphragmatic hernia (CDH), was treated by CHOP's Center for Fetal Diagnosis and Treatment. Feeding and swallowing (dysphagia) problems are extremely complex and surprisingly common in children with autism. Can't find what you are looking for? Search the news archives.